If you believe all children should grow up feeling loved with a sense of belonging, then please donate and support our work. All money donated helps us offer lifetime opportunities to our Care Experienced members. Every pound you give helps us support more people who have care experience. 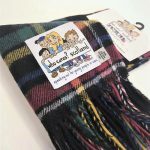 If you donate £10 a month, we will send you one of our Care Family Tartan Scarves.